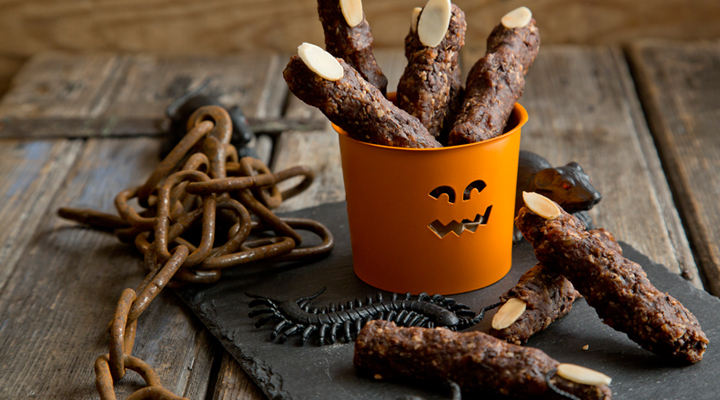 Kids can help make these, so it's a fun family recipe for Halloween. Place all the ingredients except the almonds in a food processor and pulse until it's a crumbly mixture. If you don't have a food processor, you can use a high-powered blender or smoothie maker instead. Alternatively, chop the ingredients finely and blend together in a bowl. Line a baking tray with non-stick baking paper and mould the mixture into long witches' fingers. Press a flaked almond into the ends of the fingers to make fingernails. Place in the fridge for 1 hour to harden. Serve the fingers sticking out of a bowl.